All my knives are ground by hand and eye. So Far all knives have been built from 01 Tool steel. I heat treat all the knives myself using purpose designed knife makers ovens. Please visit my Youtube channel where you will find numerous in depth videos on my various build processes. ​own personal journey into the wonderful craft of knife making. A journey that is ongoing to this very day! 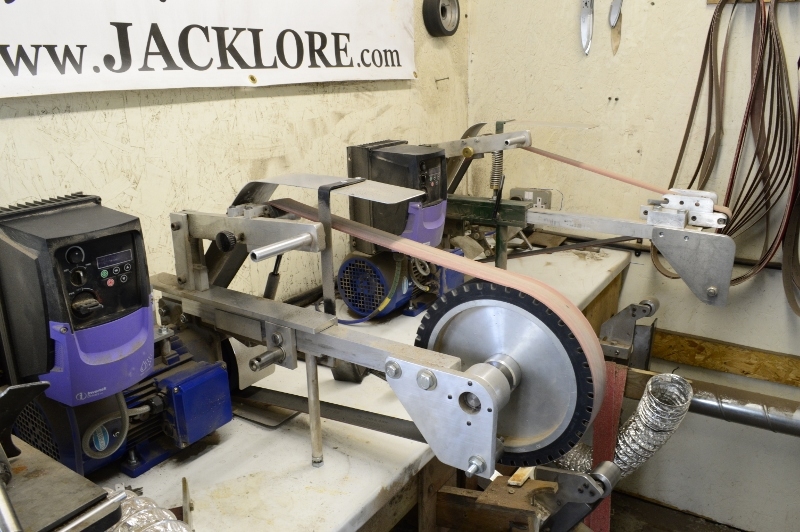 I currently have two knife makers grinders. These were both built by Alastair from Downland engineering. These two machines do the bulk of all the work and heavy grinding. I have a variety of "Tool arms" which fit both machines. Here you can see my Multi wheel head and the small wheel attachment.. I also have tool arms fitted with Plattens for grinding the bevels. This is one of my kilns. I use this mainly for the hardening process. 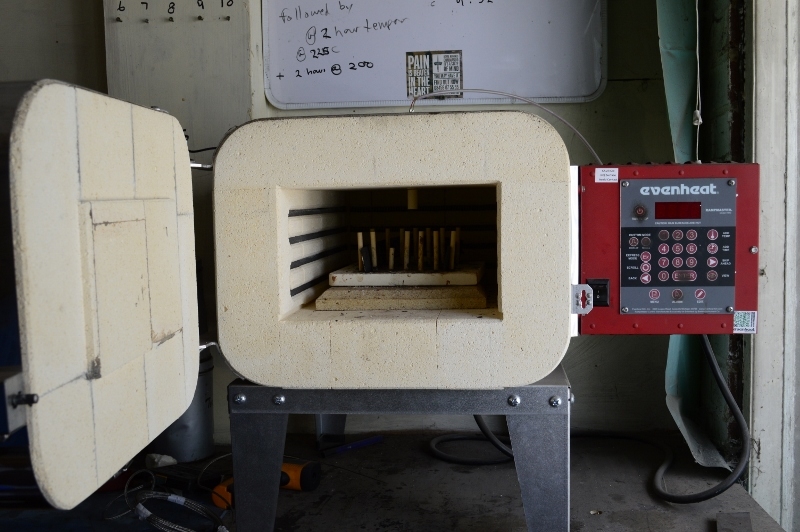 The kiln is digitally controlled and extremely accurate. My heat treatment process is something I have developed over time with A LOT of edge retention tests, destructive tests and measuring tests to determine the ideal heat treatment. Don't take any notice of the notes on the white board. That is not my Heat treat, though I do believe two hour temper cycles are the way to go. This kiln allows me to select a specific series of ramp and hold times, rates and temperatures. I like to give the steel a good "soak" at certain temperatures. Firstly I have found that this minimises warpage and secondly it allows all the carbides to melt and mingle. All my blades are prepped prior to heat treat with an anti scale compound. Above is a short video which shows some build processes prior to heat treatment. 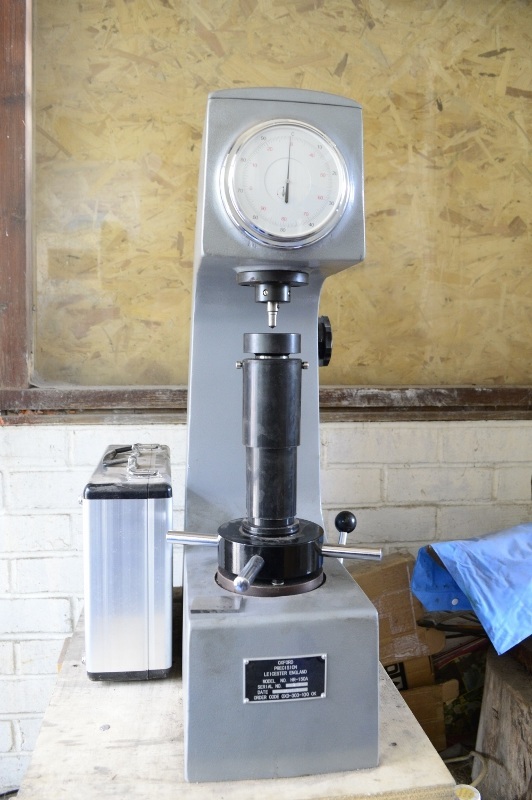 This is my Rockwell hardness tester. I love this machine. I have all the calibration blocks and test it for accuracy regularly. I test every blade in several places to ensure I have the Rockwell measurements I want. This particular machine will test to within 0.5Hrc accuracy. I have often said that when you get a Rockwell tester you almost have "Eye's that can see into the steel"
I also regularly perform other tests such as edge flex testing and also destructive testing to examine the grain structure of the steel. Not to mention exhaustive cutting and edge retention tests. A lot of hard work I know but it has given me piece of mind. I know my heat treatment is as good as I can get it. I often get asked how do you heat treat your knives? It is something I like to keep close to my chest but the best advice I can give is to make your own tests and determinations and to tweak things and test again. Yes it is going to take you a long time to find that ideal ground but it is not rocket science.